Sold for a record £29,000 by Mullock’s (20% buyer’s premium) in its February 23 sale in Ludlow, this was one of the limited edition run of 500 copies of the 1933 first of ‘My Struggle’ that were bound in vellum and signed on the limitation page for presentation. Serving additionally as a Christmas present, this copy bore a dedication by its author to Hermann Esser, a “good old comrade” who had joined the Nazi party with Hitler in 1920, became editor of its newspaper, Volkischer Beobachter, and who for a time was Hitler’s de facto deputy. Elsewhere in the sale, bid to £3900 was something very different, a pocket notebook in vellum boards, dating from 1659, in which a Dr John Baylie has entered notes concerning toothache, eye ailments, bleeding gums, neck strain, burns, gout, lice and much more besides. These Ludlow sales regularly feature material of Indian interest and this one included some very successful entries. A 1929 pamphlet of just 10pp called Guru Nanak and his Mission, a brief account of the 1469-1539 life of the founder of Sikkhism that had been valued at just £20-40, sold instead at £700. Written by Teja Singh, a professor of history at Khalsa College, Amritsar, it had a typed note attached to the cover recording it as a gift from the author to a Major ALB Anderson. Sold at £1300 was an 1898 first of Soldier and Traveller…, the memoirs of Alex Gardner, an American adventurer and mercenary of Scottish descent who had travelled and fought in Afghanistan before taking up a post as a colonel of artillery in the service of the famous Sikh ruler, Maharaja Ranjit Singh. Gardner’s memoirs, which the cataloguer described as possibly somewhat embellished, were in later years recounted to and edited by a Major Hugh Pearse. A 1965 first of Fakir Syed Wahseed-ud-Din’s much admired account of the reign of The Real Ranjit Singh realised £600. The most expensive of the Indian lots in the Shropshire sale was something rather different, being a brief, signed and dated note to ‘Bill’ Knowles, the Mayor of Darwin, that derives from Mohandas Karamchand Gandhi’s 1931 visit to Australia to meet with local cotton workers. Bearing the words “I want world sympathy in this battle of Right against might”, it sold at £5600. 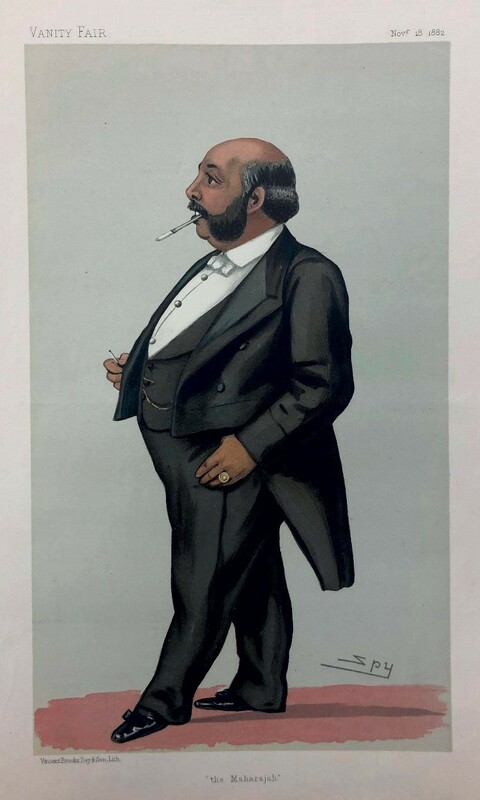 Sold for £1100 in the Indian section of the Mullock’s sale was this chromolitho caricature portrait of ‘The Maharajah’, by Spy (Leslie Ward) from a November 1882 issue of Vanity Fair. The last heir to the Sikh kingdom, Duleep Singh was only five when a series of assassinations meant this youngest child of Ranjit Singh succeeded to the title of maharajah under the protection of his mother. Maharani Jindan Kaur took on the British East India Company, which was looking to annex this fabulously wealthy state, but was ultimately defeated in her attempts to hold the Punjab for her young son. In 1854 Duleep was shipped off to England by the British, adopted as a godson by Queen Victoria, converted to Christianity and brought up as an English gentleman.